Today’s shopper is not so easy to please. What is important to him is not only the product range and prices but also the ability to find what he needs quickly. This problem is solved by personalized product recommendations which are placed on different pages of the webshop. They aim to show the user products that are of particular interest to him. Both sides benefit the shopper, who can quickly find the necessary merchandise, remaining satisfied, and the store is given an opportunity to increase its revenues and the average order value. For more details on how the introduction of product recommendations increases the conversion and sales of a store, we provide the following example of the online store Finn Flare. Finn Flare is a Finnish casual clothing brand, the history of which dates back to 1965 when the trademark was registered and the first clothing collection was released. In 1974, the brand was first introduced to the USSR, and today Finn Flare has its own brand and a partner network of more than 150 stores in the CIS. The brand’s online store receives over 800,000 visitors per month. The homepage is the very beginning of the customer journey. It is essential to get the user’s attention at this stage, so the probability that he will see “Thank you for your purchase!” on his screen is much higher. The Retail Rocket Growth Hacking team conducted thousands of tests and knew one thing – there is no universal way to guarantee increased conversion rates within the store. Everything must be verified through experience. On the homepage of the Finn Flare online store, there are two blocks of product recommendations – bestsellers and personal recommendations. According to the testing results, use of the mechanics “Popular merchandise from categories of interest to the user” in the recommendations block of the homepage increases the conversion by 8.16% with a statistical significance of 93.5%. Despite a slight decrease in the average order value, this yields a projected sales increase of 5.94%. 1. The first segment was shown only one block – popular merchandise from categories of interest to the user. 2. The second segment was shown two blocks: popular merchandise from categories of interest to the user (from above) and personal recommendations (under the block with popular merchandise). This configuration showed the best results in the previous test, so this segment was a control group. According to the testing results, use of the mechanics “Two blocks: personal recommendations (from above) and popular merchandise from categories of interest to the user (below)” on the homepage increases the conversion by 10.1% with a statistical significance of 96.1%. With a slight decrease in the amount of the average order value by 1.39%, the projected sales growth is 8.57%. The product page is an essential stage in the customer journey. Here the user studies the details, views the photo, looks at the composition, and decides whether he wants to buy this product. Recommendations are an excellent opportunity to keep a potential buyer in the store if the product he is reviewing does not quite suit him or to offer additional merchandise that may interest him. According to the testing results, a recommendation block without discount labels in the product page increases the conversion by 9.5% with a statistical significance of 96.6%. In combination with a growth in the average order value by 3.6%, the projected growth in monthly sales is 13.4%. The cart page is the last stage before making a purchase. It is important to observe a fine line here. On the one hand, do not distract the user, so that he will reach the “finish”, on the other hand, invite him to buy something else and thereby increase the cost of the order. That is why the best solution is to show complementary items. According to the test results, use of the mechanics “Standard complementary merchandise” in a recommendation block in the cart of the online store Finn-flare.ru increases the conversion by 5.85% with a statistical significance of 97.1%. Monthly sales are projected to increase by 6.98%. According to the testing results, use of the mechanics “Recommendation block with a small discount label” in a recommendation block within the cart increases the conversion by 0.63% and the average order value by 2.5%, which yields a projected sales growth of 3.16%. The experience of the online store Finn Flare once again proves: optimization of the customer journey at all stages means the opportunity to increase key indicators such as conversion and the average order value and thus the sales of an online store. 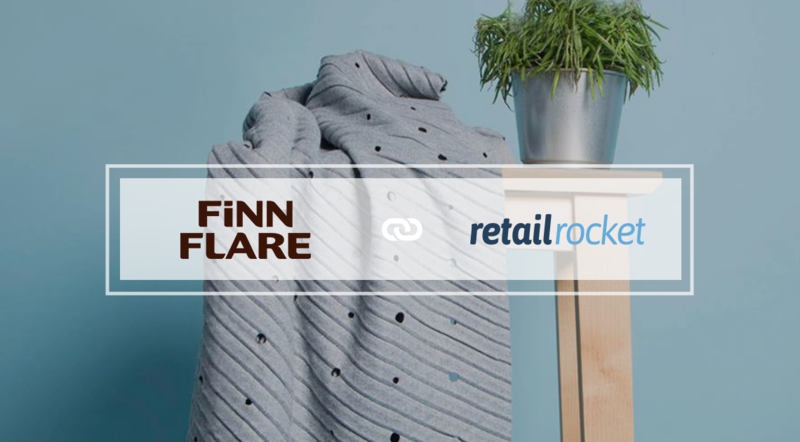 “Finn Flare maintains the strictest requirements for the quality of its merchandise and the level of service, which applies to all channels of interaction with shoppers – from the physical store to the online store and social networks. To make purchases in the online store as convenient for online shoppers as with the help of consultants in the physical store, we use personal product recommendations on all pages of the website. We are glad that Retail Rocket experts do not work by the “fix and forget” principle but continuously strive to test something new, improve existing indicators, so that our buyers get the most personalized approach and the online store increases its conversion and average order value”.